Is it cooler weather, warm food time yet? It’s still warm here, but I can feel it coming and toast slathered in warm cinnamon-rich apple butter is exactly what I want. Take a shortcut with applesauce and use your slow cooker to do all the work. I can feel fall coming. I know it’s creeping in with a few cool mornings and warmer afternoons and it seems like it just does something to us–everyone’s looking for warmer food, comforting dishes, apples and cinnamon…the soul feeding stuff. 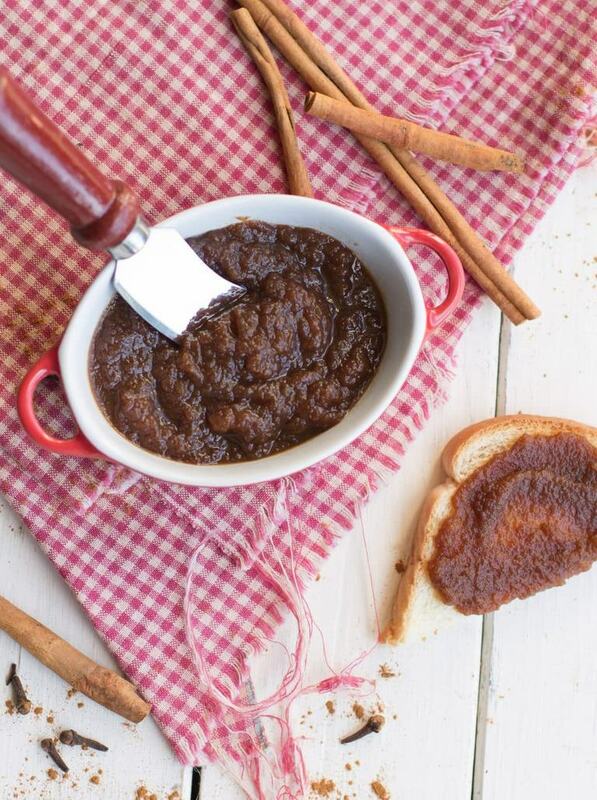 So let’s fuel your need for comfort with slow cooker apple butter. I have about .0001% of my day available now to stand over a stove cooking apples down from their God-given state, so applesauce (unsweetened only! All mean letters will be laughed at) is the absolute best way to save time and still make something almost as good as fuzzy socks and football. Just mix your ingredients together in your crock (you don’t even need to dirty a bowl!) and turn it on low. Cook the fire out of that sucker. Remove the lid for the last two or three hours or as long as necessary to reach a thick butter-like texture. Something spreadable that won’t run. Then, you can store it in an airtight container in your fridge for several weeks or can yours in canning jars (see very loosely worded instructions below). If you don’t can, just go the fridge route. You may even be able to freeze it…never tried that though. When you eat it, slather it on toast or biscuits and wait for fall. It’s right around the corner! 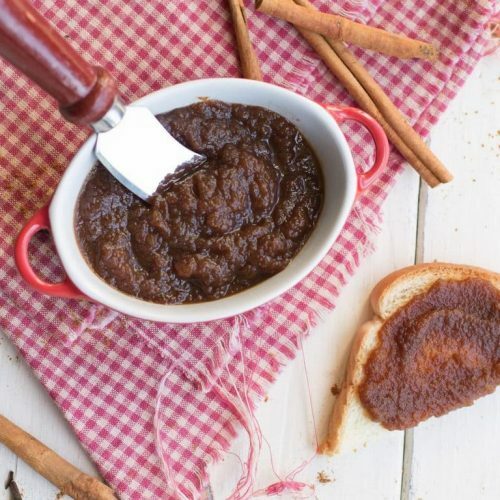 Crave the spicy, deep flavor of cinnamon and apples in this rich apple butter you can make in just a few hours with a shortcut (applesauce!). 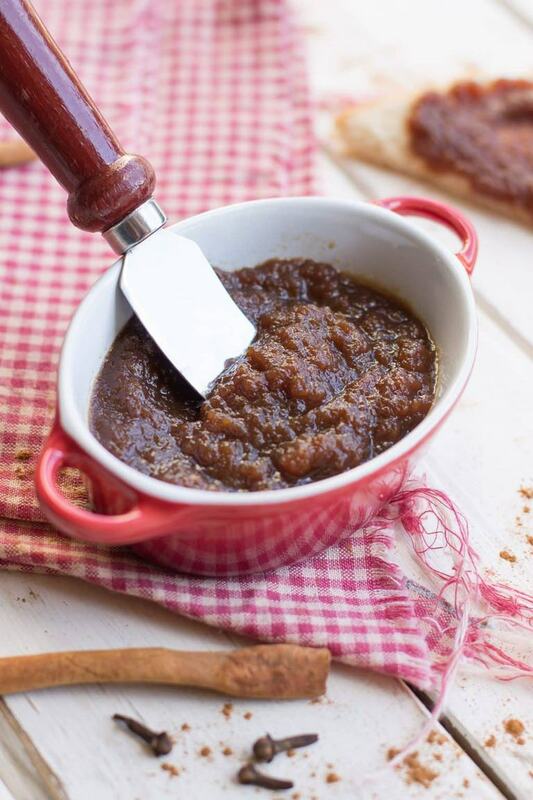 Slow cooker apple butter is a southern treat for your toast, biscuits or just a spoon! Mix all ingredients in the crock of your slow cooker. Cook on low 12 hours with the lid on. Remove the lid and continue to cook 2-3 more hours until the butter is very thick. You can cook it as long as you want to to reach your desired thickness. To store, place the hot apple butter into canning jars, add a flat and a ring and turn upside down. Allow to cool in this position to seal the lids. You can also store it in an airtight container in the fridge for 2-4 weeks. If it lasts that long. My husband and step-mother love apple butter!! We always bring her back some from the Apple Barn in Pigeon Forge Tennessee when we go there. Hubby always asks for it at Cracker Barrel. Not so good for this diabetic but, I do love it. This looks so simple that I might have to try it for them. Hi, quick question. In the recipe, it calls for apple cider. Is that right or is it apple cider vinegar? I’ve seen recipes for both. Please let me know asap!! Fixing to make it!!! How many pints does this make? Perfect to have on hand! It doesn’t feel like fall just yet here — it’s well in the 90’s today — but it’s coming, and I cannot wait for all the fabulous fall things. Including this apple butter. I clearly need to whip myself up some to prepare for the season!